The dead need their daily bread too. 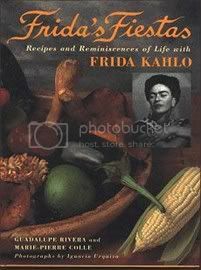 We are quickly approaching November 1st and like many Mexican households I am remembering and celebrating my dearly departed. As it is believed that November 1st and 2nd are the easiest days for our dearly departed to visit and take pleasure in earthly delights, I have lit candles and set out fragrant Marigolds to guide their way, baked delicious Pan de Muerto to satisfy their hunger and set out a glass of water to quench their thirst. 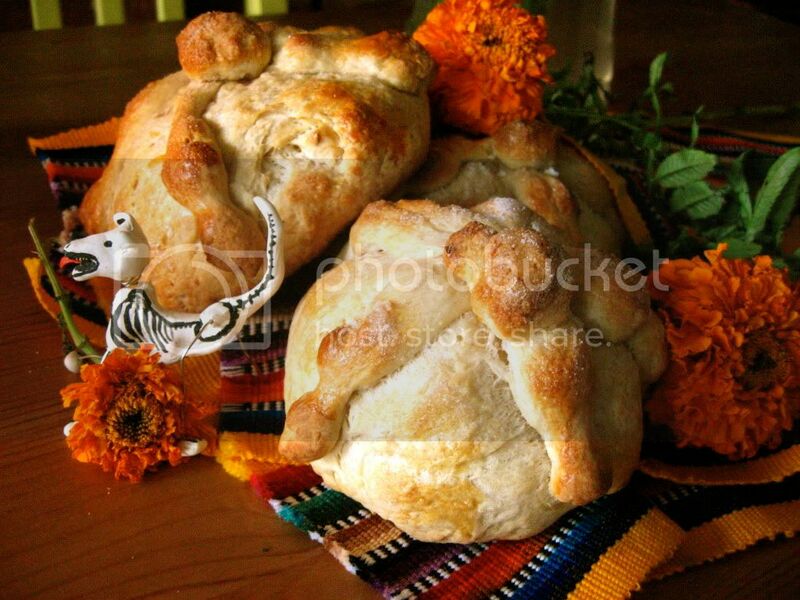 Pan de Muerto is a sweet egg bread (think a crumbly brioche) that can be flavored with fragrant anise,orange zest and cinnamon and is decorated with bone shaped pieces of dough and sprinkled with sparkling sugar. In a large bowl combine milk, yeast, orange zest, 1/4 c. flour and 1 Tbs. sugar. Let stand for 30 minutes, then add the three gently beaten eggs. Allow the dough to rest for 10 minutes. Add the butter to the dough working it until fully incorporated. Shape into a ball, grease and lightly flour. Place in bowl and cover with a damp towl to rise for 2 hours. 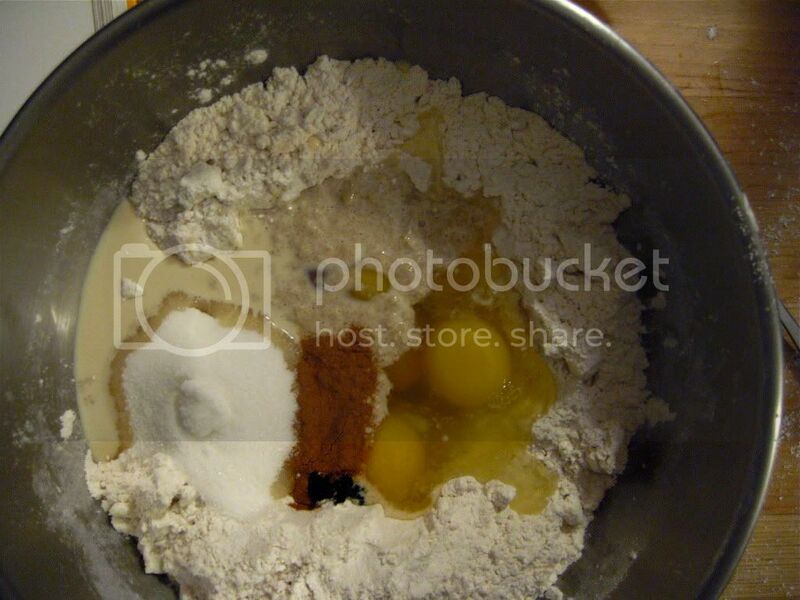 Separate dough into 6 parts. Shape 5 into balls and place on a greased baking sheet. Decorate the tops of the rolls with the remaining dough by rolling the dough into coils and strips that look like bones. Allow the bread to rise for an additional hour in a warm place. brush tops of bread with egg white and dust with sugar. Bake in a preheated oven at 350 degrees for 25-30 minutes. Gabrielle Marie Lopez lives and works in Harlem, New York City. She, along with her boyfriend, Alex Uballez, run the blog Gabriela’s Kitchen that focuses on traditional Mexican Home Cooking and Contemporary Interpretations of Latino Cuisine. Gabrielle’s passion for cooking was spawned by her mother, grandmother and madrina and has been nurtured by her mentor and friend, chef and cookbook author extrordinaire Zarela Martinez. Gabrielle is also the Harlem correspondent on Top Chef Master Marcus Samuelsson’s blog. What a yummy recipe! I am enjoying you Day of the Dead posts!! I’ve been reading all the posts here about Dia de los Muertos and really thinking this week on what we will do at our house. My husband is originally from Michoacan and I would like to start celebrating this in our home more intentionally and involve the kids. There is no time like the present. Coincidentally, last night hubby was whining I haven’t baked anything lately, and the other day our little toddler boy finally figured out how to roll play-doh into little log shapes by himself — he can help with kneading dough and rolling out the bone shapes for the tops! I’m totally stoked for our family to try this recipe. Maybe on November 2, when the (non-hispanic) grandparents will be here for a visit. I know my sister-in-law knows how to make the atole drink and I bet she will. Yum! Interessant. Kommt hier noch ein Folgeartikel? I just made this with my almost four year old and we had a great time. It is delicious! We set up the altar in between steps. I love this! Mine is rising for the 2 hours! I’m doing this for extra credit! Thank you! Good way of explaining, and fastidious article to obtain facts on the topic of my presentation subject, which i am going to deliver in institution of higher education. This recipe, as it is, doesn’t really work. The yeast needs to be mix in warm water or at least have the milk warm up a little bit to active the yeast, otherwise the dough WON’T RISE! Not to mention, the bread will be hard after baking, not soft as it should be. My name is Erin, I was referred to your company by a blogger that wrote a review about your service. Does your company still work with bloggers to post about your service(s)?